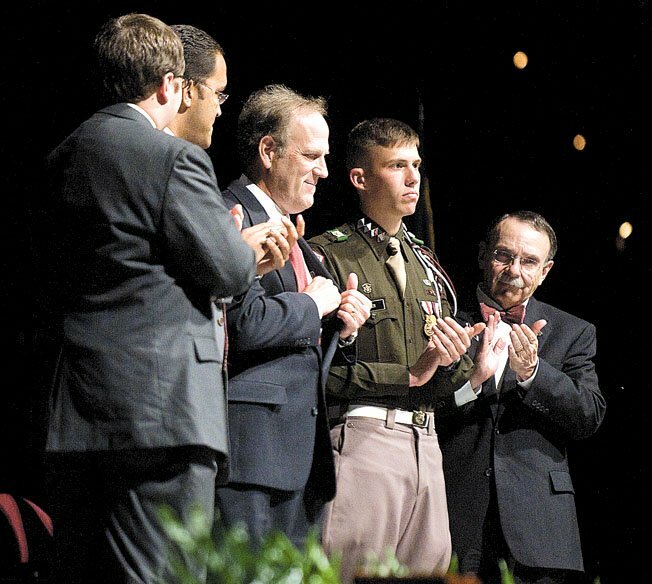 Richard West, center, the father of Nathan Scott West, receives applause from (from left) Texas A&M student body president Kolin Loveless, former student body president Will Hurd, Corps Commander Brent Lanier and Texas A&M interim President Bowen Loftin at a memorial service at Reed Arena Tuesday, Nov. 17, 2009. 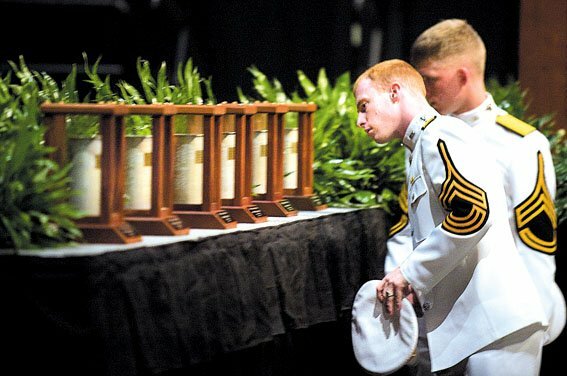 Members of the Ross Volunteers honor guard look at cannon shells that were fired in honor of the 12 Aggies killed in the 1999 Bonfire Collapse during a memorial ceremony at Reed Arena Tuesday, Nov. 17, 2009. Dozens of pictures from the beginings of Bonfire up to the tragic collapse of 1999 were on display Wednesday afternoon in the lobby of G. Rollie White Coliseum. The Bonfire Exhibit was available for viewing in the Rudder Exhibit Hall until yesterday, when it was moved and where it will be dismantled and placed back into the archives after Wednesday. It included a small shrine with framed 8x10 photos of all 12 fatalities, and exhibit boards containing scores of shots from the early 1900s on through the collapse. Twelve portraits of those killed in the Bonfire Collapse were on display with a single rose placed beneath each victim as part of the Bonfire Memorial Exhibit in the lobby of G. Rollie White Coliseum Wednesday afternoon. Officials couldn’t provide an estimate about how many people attended the candlelight vigil, but the Traditions Council handed out about 5,000 candles, and some brought their own, officials said. The entire area of the spirit ring — the encircled part of the memorial measuring 170 feet in diameter — was packed with people who spilled out into the berms surrounding the memorial. The Aggie spirit shined brightly earlier this week after a shipment of drip guards for the candles didn’t come through. A few dozen Aggies bought several thousand three-ounce paper cups, poked holes in the bottom and slipped the candle through to create makeshift wax catchers. “Some things don’t turn out the way you wanted them to, but you do the best you can,” said Jordan Kana, who is with the Traditions Council and took part in the paper-cup effort. A few hours before the 2:42 a.m. event, at an 8 p.m. ceremony in Reed Arena, the father of one of the students killed in the collapse told current Texas A&M students that it’s now time to be happy and celebrate the memories. “The fire may not burn in that spot, but the fire burns, and it burns in the heart of all Aggies,” said Richard West, the father of Nathan Scott West. West was the featured speaker as about 4,000 gathered in Reed Arena to mark 10 year anniversary. The speakers during the hourlong service included Texas A&M Interim President R. Bowen Loftin; Brent Lanier, student commander of the Corps of Cadets; Will Hurd, student body president during the collapse; and Kolin Loveless, current student body president. “It was simple and good,” said Stephen Klock, a 26-year-old Aggie, of the low-key service that began with a bustling crowd instantly falling silent as the arena dimmed and ended with a rendition of The Spirit of Aggieland by the Singing Cadets. A short video told the story of the collapse, from the teddy bears, flowers and on-site memorials to the A&M football team’s win against chief rival the University of Texas at Austin a week later, as the Aggies still mourned. Hurd, who worked for the Central Intelligence Agency for nine years after he graduated and now is running for Congress, recalled how students at the time didn’t know how to deal with grief as helicopters hovered overhead. “We were kids,” the San Antonio resident said. Clay Kuboviak was in high school during the fifth-year ceremony, when the Bonfire Memorial was dedicated and tens of thousands packed around it to hear Gov. Rick Perry and others speak. The 23-year-old couldn’t get good seating then and wanted to make sure that didn’t happen again Tuesday, so he arrived about three hours early, peeking and tapping on the glass doors, trying to get in. “If it wasn’t for bonfire, I wouldn’t still be in College Station,” said Kuboviak, who now works on an off-campus bonfire not sanctioned by the university. The ceremony ended about 9 p.m., and some in the crowd headed toward the Bonfire Memorial to await the next remembrance ceremony. After the Reed Arena event, parents of those who died said the best part of the ceremony was knowing that Aggies remember their children. West said he still receives a hug, handshake and tear every now and then in the airport when Aggies realize who he is. “It helps to know that other people continue to remember our children,” said Neva Hand, the mother of Jamie Lynn Hand. That’s not something the families of the 12 will ever have to worry about, said Loveless, the current student body president.